Making wine is easier to make than beer. Using a wine concentrate kit, you will get consistent results without having to boil your ingredients. A little more patience is necessary though as proper winemaking requires up to 6 months. 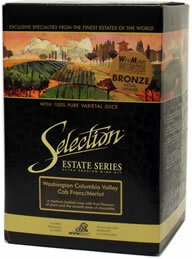 We carry the popular brands of both dry and liquid wine yeast. Capden Tablets, sodium and potassium metabisulfite, are used to prevent wild yeast & bacterial growth and oxidation. Ascorbic Acid prevents oxidation and discoloring. Wine clarifiers help wine to clear more quickly and can achieve clarity in weeks rather than months. We carry enzyme, bentonite, gelatin finings, isinglass and others. Use a testing kit or your tongue to determine the acid content of your wine. Low acidity leaves the flavor dull or flat; too much gives your wine a tart or sour taste. 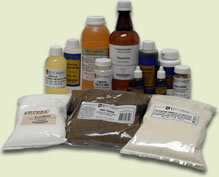 We carry all the popular acid adjustment additives. Stop fermentation prior to bottling with sodium benzoate or potassium sorbate. Use glycerin and tannin additives as part of your finishing. 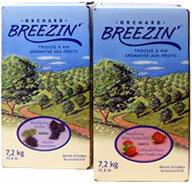 Wine oaking can be achieved in mini casks or with oak chips or cubes. Call us with your questions. This equipment kit has everything you need to start making your own wine at home except for (30) 750ml bottles and a wine kit. Wine kits fall into three basic categories: mostly concentrate, juice and concentrate, and all juice. Excellent wines can be made with each. Affordable, easy to make, and easy to drink, they are a perfect balance of fruit and wine – not too sweet, and not too dry. Flavors include: Blackberry Merlot, Calypso Bianco, Cranberry Chianti, Green Apple Gewurztraminer, Peach Chardonnay, Raspberry White Zinfandel and Strawberry Riesling. Winexpert's Wines from Australia, California, South America and Europe are represented in the Vintners Reserve World Vineyard Collection. These 4-5 week wine kits are perfect if you enjoy versatile wines which don’t require extended aging but still offer distinct flavors from some of the great wine regions in the world. 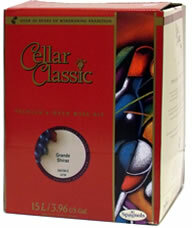 Cellar Classic 6 week wine kits are blended from the finest grape juices and concentrates, selected from around the world. Many kits include toasted oak chips, for barrel-aged character and increased depth and complexity. This marriage of superior ingredients gives you a superior wine. Cellar Classic wine kits contain 15 liters of premium juice and concentrate (compared to 7 liters, which is standard), which means you add very little water to make 23 liters of wine. You'll end up with wines that are brilliantly clear and bursting with rich, full aromas and flavors. Selection Estate Series 8 week wine kits have re-defined the premium wine kit landscape, by offering a very limited number of prestigious varietals and styles, sourced from exclusive vineyards in the world’s greatest winemaking regions. Blended with 16 litres of 100% pure varietal grape juice and varietal grape juice concentrate, with no added sugars, this ultra premium wine kit yields wines of exceptional flavor, aroma, and complexity.